In a bowl, add all vegetables – Red & Green Capsicum, Carrot, Cabbage and Onion. Add Mayonnaise, Black Pepper Powder, Chilli Flakes, Garlic Powder and Salt. Apply Butter on one side of Bread slice. Spread a thick layer of Vegetables & Mayonnaise mixture. Cover with another bread slice to make sandwich and press gently. Heat a non-stick pan on medium flame and spread some Butter. Put the Sandwich on the pan and apply butter on top. Flip the sandwich and cook till both the sides turn crisp and golden brown. 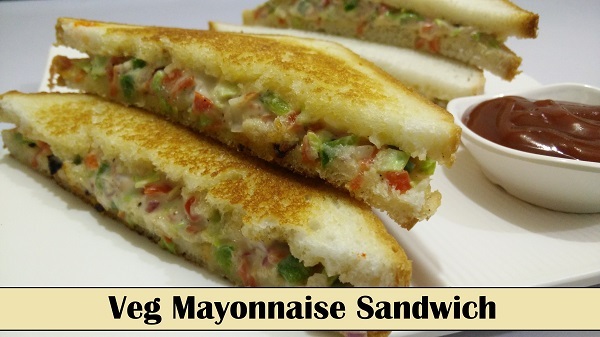 Serve Veg Mayonnaise Sandwich with Chutney or Sauce.